Listed in: Gowns, Mother Sister Bridesmaids Gowns and Veil categories. Get more for your wedding! 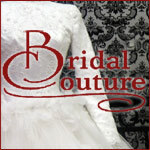 Don't forget to mention ChossonKallah.com when visiting Bridal Couture. Mention ChossonKallah.com at Bridal Couture when renting or buying your gown and you'll get a FREE wash and set for your sheitel.